'Banned In Boston' ( Kevin Vaughn, R. 2007). Seedling #E50-1. SPU, 33-39" (83-99 cm). Early midseason bloom. Standards rich dark blue-violet; style arms rich blue-violet, orange influence toward edges; falls cream base, 1/2" purple-violet band, fine blue-violet lines in center, orange dagger signal; compact form, ruffled. 'Offering' X 'Lucky Devil'. 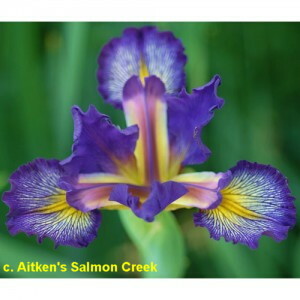 Aitken's Salmon Creek 2012. Honorable Mention 2017.